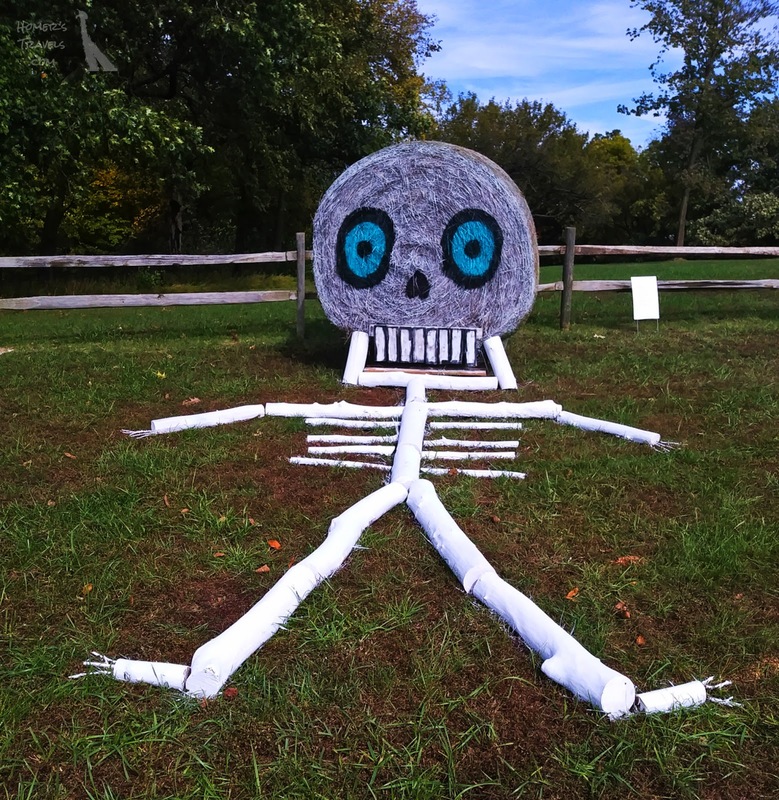 A hay bale skeleton on display at Indian Cave SP. This year the Wife and I will skip the giving of candy. Not enough kids came by last year and we couldn't, and shouldn't, eat it all the candy ourselves. 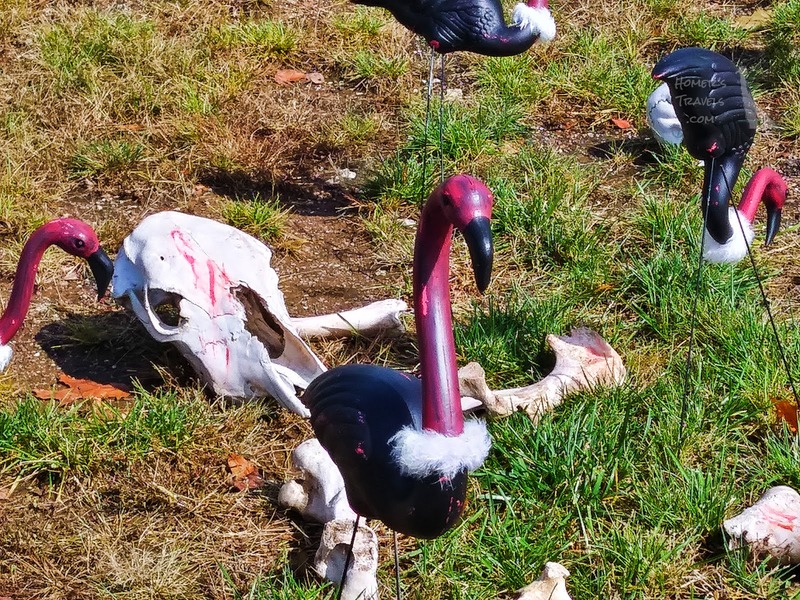 Flamingos disguised as buzzards at Indian Cave SP. Book: Charlie Jane Anders' "All The Birds In The Sky"
I received this book as a free ebook. It won the 2017 Nebula Award for Best Novel. I'm not sure who is choosing these winners. The book is OK but not great in my opinion. Charlie Jane Anders' "All the Birds in the Sky" follows two children as they grow up to be leaders in their two factions: Technology vs Witchcraft. Civilization and the environment are breaking down and the world is moving towards armageddon. The two factions are working to save the world though they are mostly opposing each other. In the end the two protagonists bring their considerable skills together to halt the decay. The book was OK. It was well written. The issue I had was the shallow feeling of the story. It misses some depth. The opposition between the two factions should have been more pronounced. I also have issues with the rather stereotypical portrayal of the protagonists. The tech-centric geek is a guy. The nature loving witch is a woman. The witch was a little goth when she was young. The geek hated to go outside in nature and was awkward. The ending was abrupt and wrapping up in too quickly. There was no discussion of the aftermath of it all. In the end I gave the book three stars out of five on Goodreads. It could have been better. I returned to Indian Cave SP yesterday and saw that the colors had faded to shades of brown. 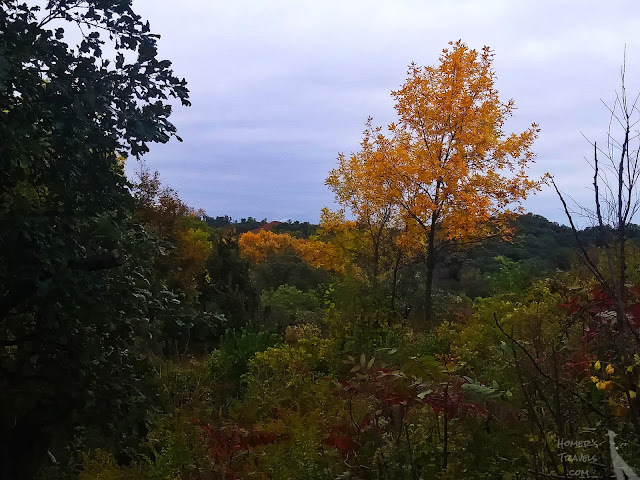 This is the time of year when the visual delight of fall colors gives way to the auditory one of the swish - crunch, the sound made as my feet move through the carpet of fallen leaves covering the hiking trail. 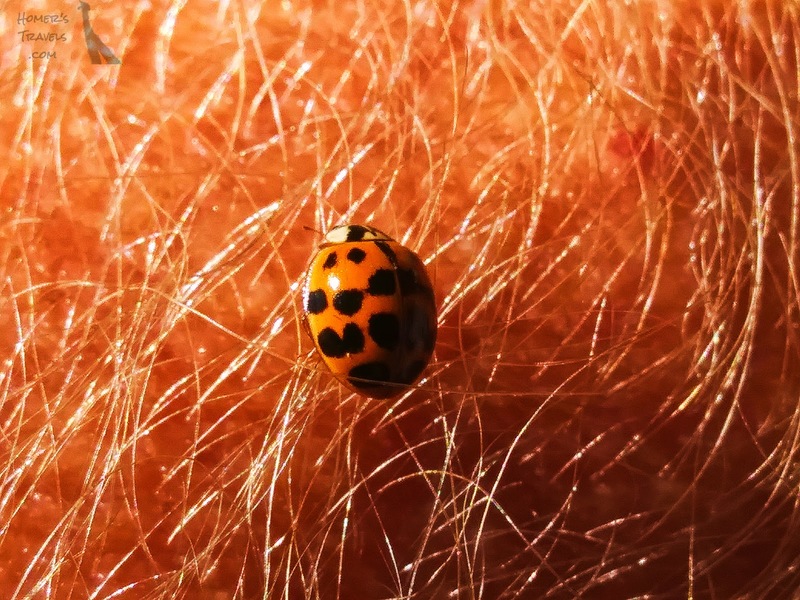 A ladybug on my hairy arm. I exited the trail on the way back to my car when I was surprised to see a thin cloud of swarming insect. 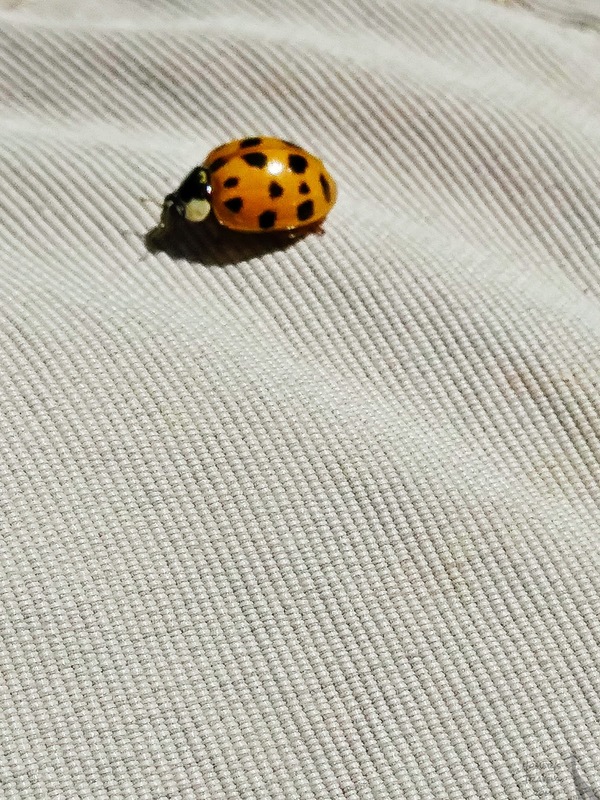 I sat on a bench to rest and was immediately joined by four or five ladybugs landing on me and my cell phone screen as I was taking pictures. I don't think I have ever seen so many ladybugs at once - the closest was in 1996 on the ladybug trail in Sequoia NP though those were huddled on the ground warming themselves in the sun. These were buzzing around me as I sat on the bench and as I walked the miles or so back to my car. A few even joined me on the drive back to Omaha. A ladybug on my pants leg. The ladybugs were a nice ending to a rather tough 8+ mile (12.8+ km) hike. This is the fifth anniversary of the end of my second Camino. 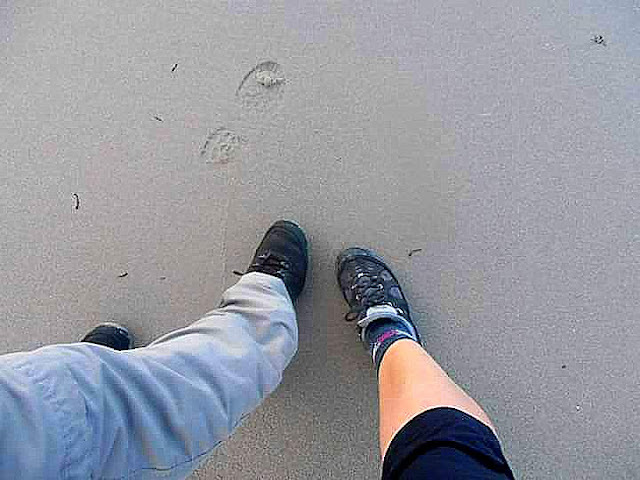 Five years ago Gv and I arrived in Fisterra and left our footprints in the sand before watching the Sun set over the Atlantic Ocean. A day of wonderful, and melancholy, memories. The end of our second Camino on the beach near Fisterra. What a difference a few days make. After a fairly substantial 3 inches (7.6 cm) of snow on Sunday, the temperatures finally stabilized at a comfortable and slightly crisp fall-like 60℉ (15.5℃). Combine these temperatures with the changing of the foliage and I'm finally getting into the Fall spirit. 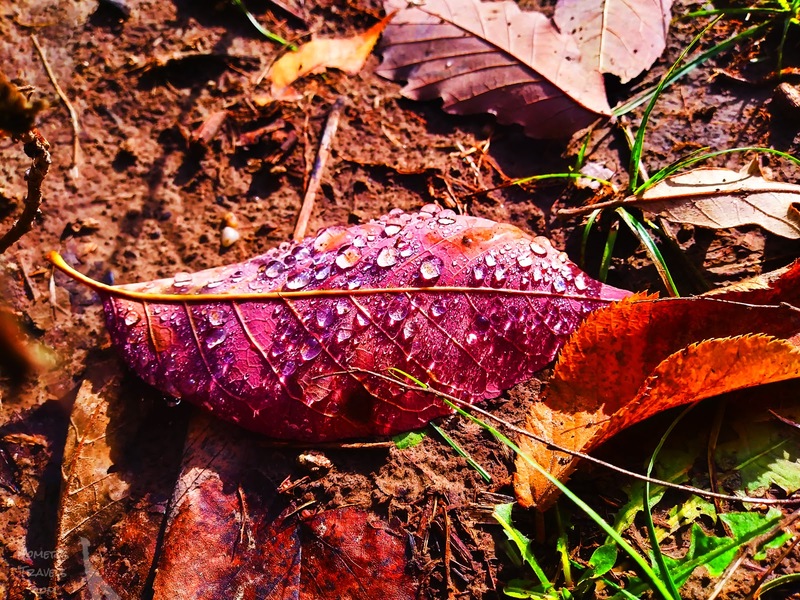 A red tinged leaf with morning dew on the trail in Indian Cave S.P. 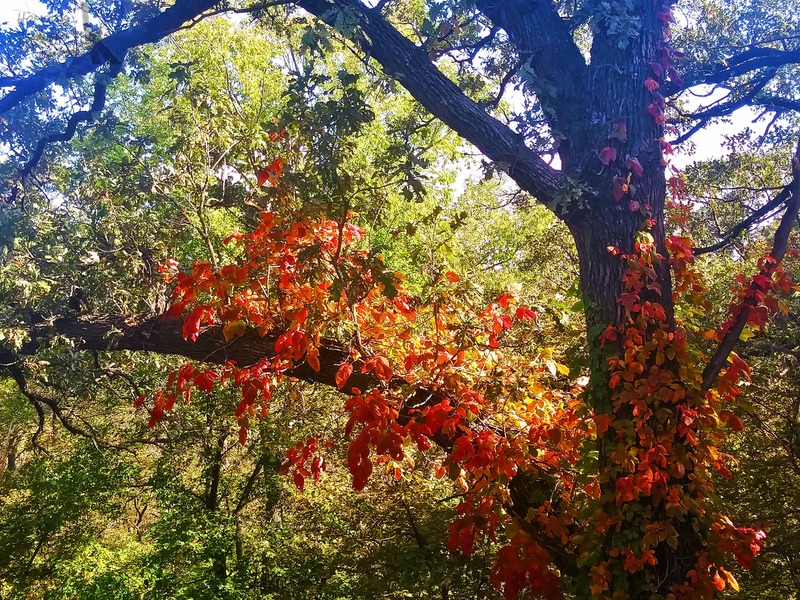 Over the past three or four weeks I have been going to Hitchcock Nature Center and Indian Cave State Park and over this period I have watched the trees turn gold, yellow,orange, and red. Indian Cave has the most colorful foliage. In the past I have always been either too early or too late to see the Fall colors in 'full bloom'. Hiking a couple times a week has given me the opportunity to admire the change. Hitchcock's colors are predominantly gold and yellow. Small bushes add pops of dark red and parasitic vines added orange. Orange leaves of a parasitic vine. I wish the colors would stay all winter but the leaves will soon be falling. On a walk earlier this week I walked on some sidewalks covered in green leaves that fell after the Sunday freeze, never getting the chance to turn colors. A pop of yellow at Hitchcock Nature Center. Fall has always been one of my favorite seasons. This year has been a bit strange with the higher than normal temps and rain. The Fall has also taken on some melancholy hues with the memories of 2016. Nevertheless, I still have a warm place in my heart for this change-filled time of the year. The weather this fall has been weird. Record high temperatures followed by record low temperatures. I always look forward to the crisp fall days but this year we haven't had them yet. 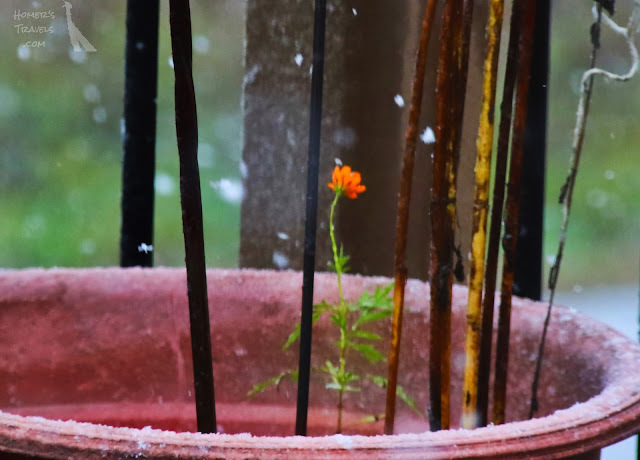 A late fall flower wondering what this white stuff is falling from the sky. Today we had our first snow of the season. It was supposed to be a light dusting but it turned out to be a bit more substantial triggering a Winter Weather Advisory. 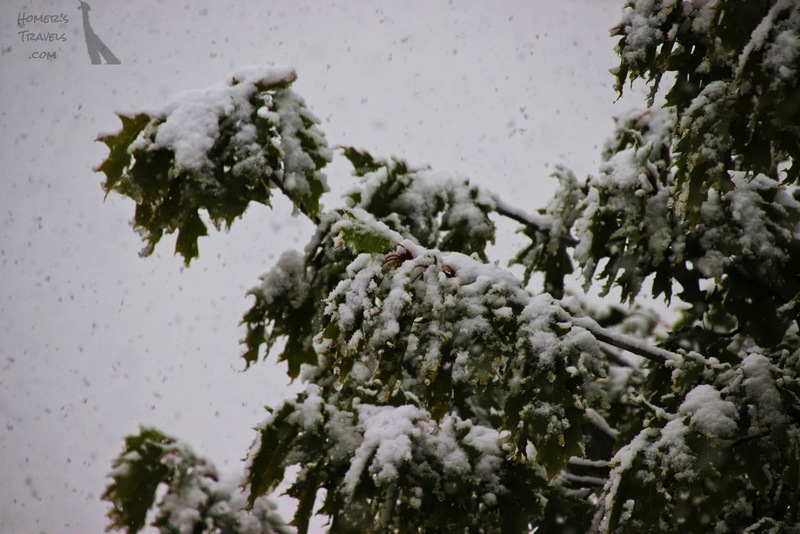 Our oak tree's leaves haven't changed color yet but they are covered in heavy snow. It's a bit early for snow here. I do remember a snowfall this early sometime in the last ten years but I don't remember which year. 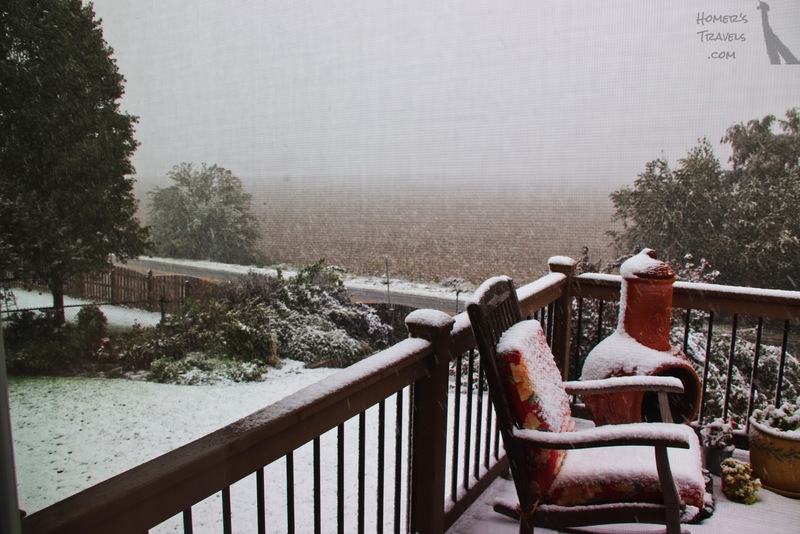 Usually the first snow is in November or December. Like the last time it snowed this early, it won't last long. This week - a month late in my opinion - the crisp fall air will finally arrive bringing the temperatures back to normal and melting all the snow. Visibility is a bit limited by the falling snow. I wonder if this is a preview of the winter to come. I needed a pick me up so I checked out Jon Meacham's "The Soul of America: The Battle for Our Better Angels" from the library. I hoped it would give me some perspective on what's happening in our world today. I don't think it did what I expected. Meacham wrote this book to show that America has seen the current problems before and the country has always made it out the other side of each crisis. 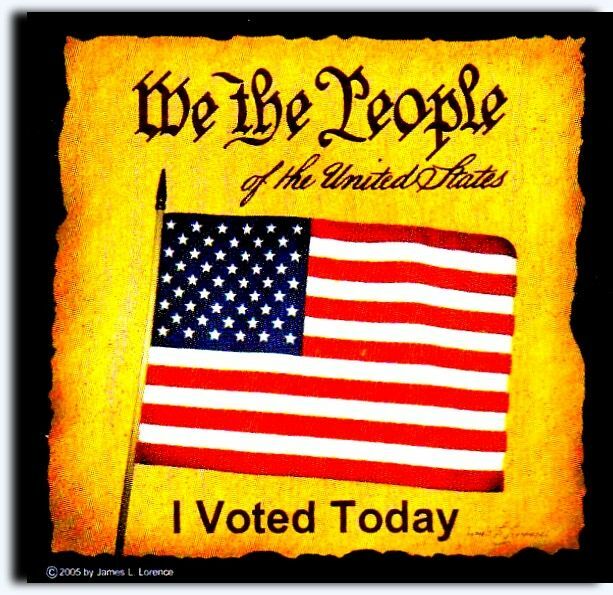 Racism, misogyny, fascism - our country has seen them all over and over throughout our history and each time we made it through. This should have been encouraging to me but it wasn't. What I read was that racism, misogyny, fascism, and all the other evils have been beaten down over and over again and they just come back. We have never, truly defeated them. I finished this book a little bit more pessimistic. Sigh. I gave this book four stars out of five on Goodreads. You can't knock a well written book because it exacerbated my pessimism. On Saturday the Brother-in-Law told us that Bill Murray was going to be in town at the Holland Center. Turns out it was Sunday night so we bought tickets. This was a bit short notice for us but we'd done things with shorter notice before. The show was Bill Murray on vocals with Jan Vogler on cello, Mira Wang on violin, and Vanessa Perez on piano. 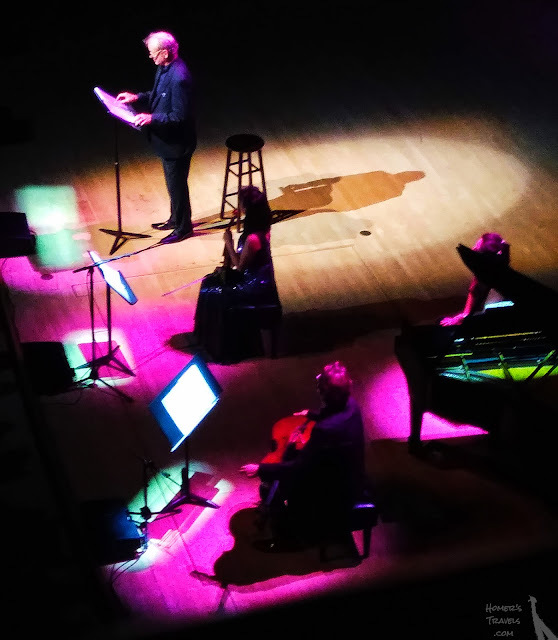 It was a combination of storytelling, poetry, spoken word, and classical music. It was a semi-sophisticated Bill Murray. Our view of Bill Murray - mostly in profile with emphasis on his bald spot. When I realised what it was going to be I wondered what I'd gotten myself into but it turned out to be entertaining and, while no Sinatra, Murray can carry a tune when he needs to ... and he does a mean tango too. The readings were interesting and often humorous. Murray was a bit self-deprecating and didn't shy away from some minor political commentary. His reading from "The Adventures of Huckleberry Finn" was considered by the Wife (an English teacher) to be one of the best she's ever heard. After the encore Murray was given a bundle of roses which he began to throw out to the woman in the audience. He spotted the Wife. We were in a second tier box seat to the right of the stage. He threw a rose up but didn't make it. To his credit he didn't give up. He threw a couple more until the Wife, perilously close to going over the rail, caught the rose to the cheer of the crowd. The last rose went to the unnamed piano music page turner after she got the loudest cheer from the audience. In the end, we had a great time with our new friend, Bill Murray.